Once there was an online marketer, who, by today’s standards, should be seen as a genius: He could sell massive amounts of products and make an enormous amount of money, simply by sending web traffic to a landing page. This landing page would do nothing special: It would simply present the product in question to the web visitor. And he didn’t need to collect mail addresses. He didn’t need to do any email marketing at all. This was a long time ago. 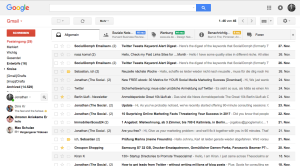 And even this genius online marketer has now opted for email marketing. And if you ever plan to make money with your blog or web presence, then 2017 should be the year you opt for email marketing. There is a simple explanation why it is often impossible anymore to sell anything on the web without having an email marketing strategy in place: Trust. If you found an article in a magazine, you had the perception that the information in this magazine had to have passed several editors and for that had to be well researched. And you would usually be right. If you went to a bookstore, the books had been published by respectable publishers with well-paid fact checkers and editors – therefore the book should adhere to certain quality standards. If you bought clothing offline, you could see the quality of materials right in the store. If you bought tech products in a store, you would usually get well-informed guidance by the shop’s staff. In the early days of the web, people regarded information on the web in a similar way: It was information, it came from people who were able to publish on the web, it had to be respectable… right? That trust is gone today – and you’ve got the genius marketer from the introduction to thank for that. This genius marketer provided respectable looking information, generated traffic through good search engine optimization and well-targeted ads, … But then he sold his audience bad products. He lied to them about the quality of his products. And it turned out that this genius marketer wasn’t such a genius, after all, he wasn’t alone – he was in the company of many others doing exactly the same. And after millions of bad products being sold to the general web population, the trust is gone. And before you will ever sell anything on the web, you have to get it back – for yourself. 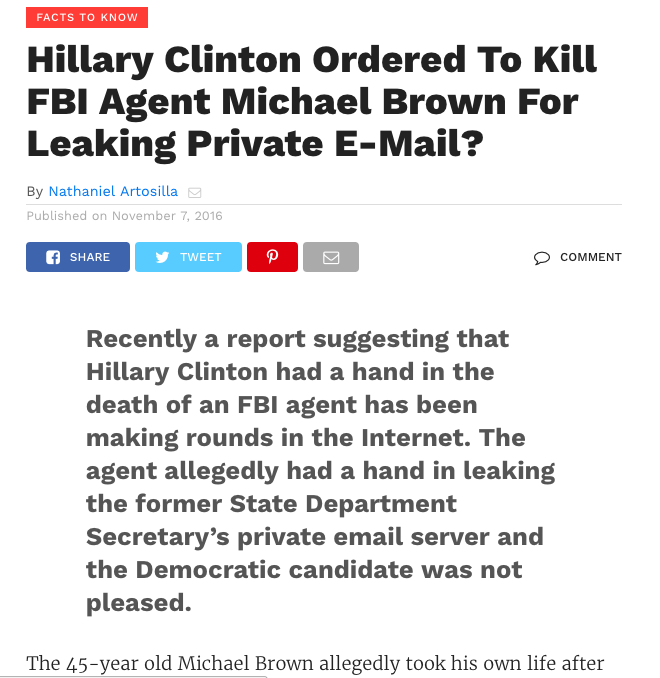 Fake news like this one spread like wildfire during the election… from both sides. And you ask why people don’t trust websites they don’t know? Red Bull sponsors high-performance athletes to nurture the idea that Red Bull heightens your performance. Apple’s slogan “Think different” targeted creative professionals once upon a time (before they became the brand that basically targeted everyone that could afford Apple’s products). That, however, doesn’t mean big companies don’t have to combat these trust issues as well. Think about Amazon or eBay with millions of products on their websites; these companies have to show a product or a seller is trustworthy if they want to generate sales. 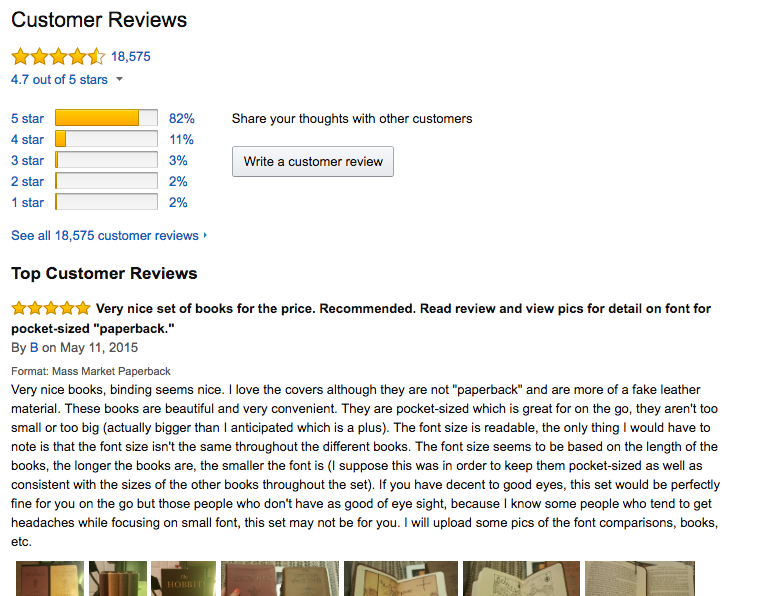 That is why they show trustworthiness by user-generated ratings. You might now believe that you do have a brand after all – for instance because you constantly have visitors to your site. But the reality is: You probably don’t have anything (at least if you don’t have an email list yet). How many of these visitors are returning visitors who visit your site more than once? How many of these visitors trust your information enough to share it with others? It is a widespread misconception that visitors on your site are a trusting audience when all they are really is just an audience – the trust will usually come long after their first visit. You don’t go to the cinema once to see a movie and will come out trusting the director. This is where email marketing comes in – because, while email marketing is almost never the first contact you have with a visitor of your website, it can fulfill the above criteria. Which of these buyers journeys yields the better results, you think? Email should be seen as a “second-step” web traffic source: People don’t first subscribe to your email list before they ever visit your website. There are exceptions to that, but you get the point: Usually, the first step is to get people to your website, where you get them to perform a sign-up which turns them into people that you can contact over and over again. While there are other ways to have people subscribe to your website (RSS, social media, …), we humans place a lot higher value on information we receive via email than on information we see on any other online source. Email is, for most people at least, still the way we communicate with close friends, family, and colleagues, while the brands we follow on social media have far less importance for us. That means that every email we get starts out as being almost equal to a personal interaction (if that email passes the spam filter). Of course, we do get 100s of emails every week (or if you are like me, every day). We don’t open them all, but we at least skim the subject lines. Email is a trusted source as well as a personal source. And being able to contact someone via email is, therefore, a good first step to building trust. While this may sound like people are not very willing to give their email address to a stranger running an unknown website, that is really not the case! Because usually, if we give our email to someone via a newsletter subscription and we want to get out later, we can: We can either simply unsubscribe from the email list, or, if for whatever reason that doesn’t work, we can move the sender to our spam folder and be done with it. When we give away our phone number, we won’t get it back. That is why it is relatively easy to get people to subscribe to an email list. Offer a simple newsletter subscription form on your website. 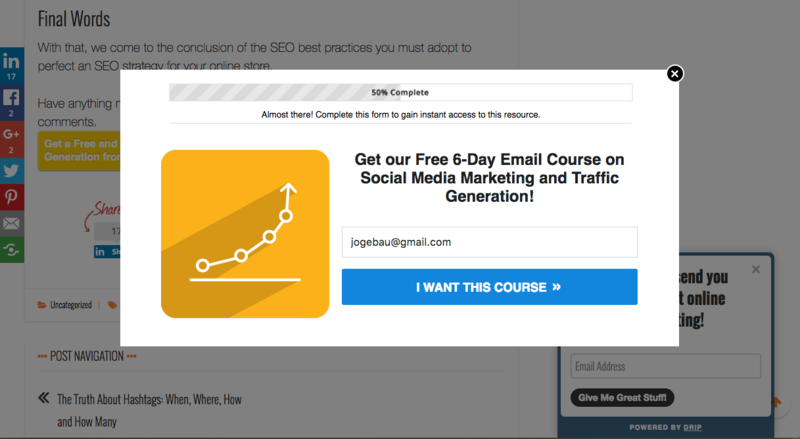 (Most email marketing tools already come with this feature built-in). Offer free material on your site that can be downloaded in return for the visitor’s email address. Offer content upgrades in blog articles (free information related to the article in return for the email address). Use tools like HelloBar and/or SumoMe to implement newsletter signups (both reward based and non-reward based) at various places on your site. You can read more about various techniques to get newsletter subscribers in this article on our blog. Experiment with the various forms and especially combinations of them. The goal is to generate between 5% to 10% of new email subscribers from the visitors on your website. A signup lightbox promising free content. In the background on the lower right, you can see another, less intrusive box opening with a simple signup. One thing that is especially important in email marketing is that you always need to deliver on your promises – or even overdeliver. People who got promised an ebook won’t trust you again if all they got was a single page of content. While getting an email is a good way of starting a trusty relationship with that person, it’s only a start. Once you have it, you need to communicate with that person, and you should not be afraid to use that email address. 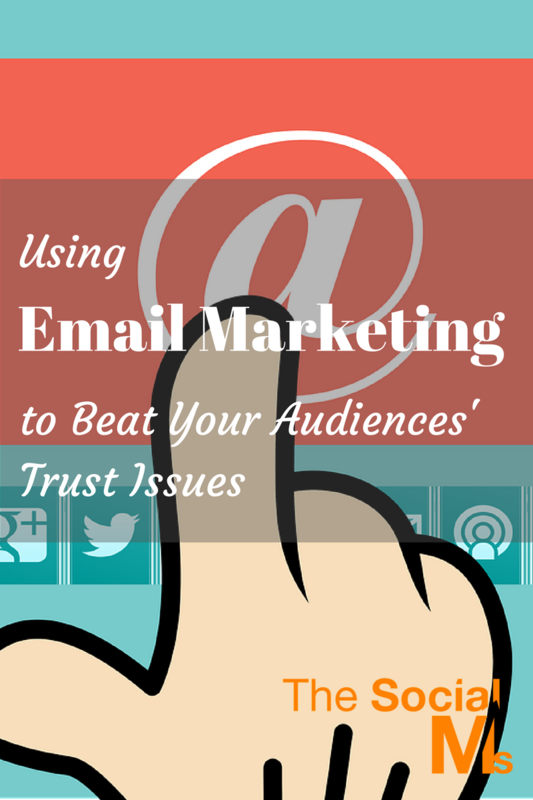 If you don’t use that email address by sending regular emails, you won’t build trust. People forget about how they subscribed to your email, and if you wait just a couple of weeks before they get your first email, all they are going to do is unsubscribe from your newsletter. That is why you need to constantly send out newsletters – I like to recommend a minimum of once per week! Yes, minimum! At several points of my own marketing journey, I have been subscribed to newsletter lists which resulted in multiple emails per day, and I loved every email. However, what you shouldn’t do is sell – at least not in these first emails. Or, at least, not directly. It is ok to mention your products, as long as the context of the email is still delivering value to your subscribers. But simple sales emails are not allowed to new subscribers – because sales emails do not deliver trust. What I like to do is send subscribers to various automation sequences once they sign up. These are sequences of emails that send new subscribers our best-running blog articles – blog articles which I am sure are of value to a lot of people. The beauty of these sequences is that I can set them up once and already know that the content delivered will speak to my audience. To even increase the effect, I will also throw in emails with short tips and emails with links to more free ebooks and other advanced information. A simple automation workflow in Drip. 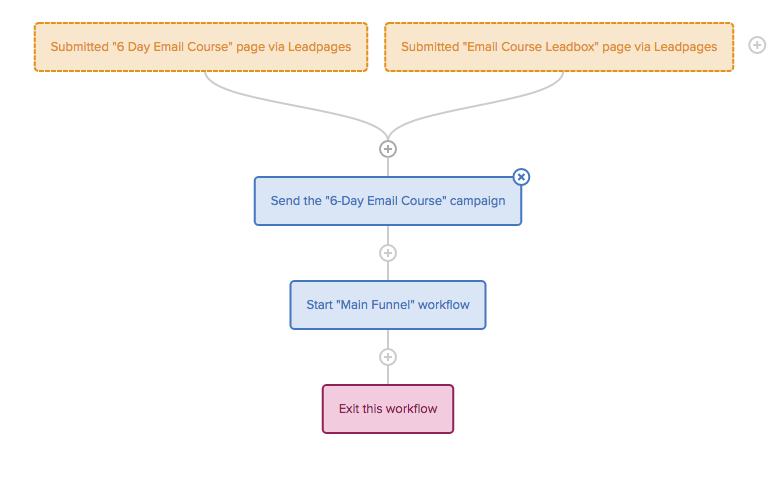 Note that you can move subscribers from one Workflow to another and use Campaigns within Workflows! I will also collect a little bit of data about my new subscriber by asking questions in return for another free piece of content and noted the information in the database in my email tool. Once a subscriber received all emails in the automation sequence, I will move this subscriber into my broadcast segment, where I keep all the subscribers that are currently receiving my regular updates that I send out every time we have a new blog article to share or other information to send out. The goal is to constantly nurture email subscribers over a long period of time. For creating an automated onboarding sequence, gather all the data you have from Google Analytics and social shares: Which articles on your blog sparked the most social shares and which generated the most traffic. For a start, select the 3 best-performing articles and add mails with links to these articles to your automation sequence. Later, you can add more emails to your automation sequence. Fork the sequence if the subscriber performs specific actions, etc… Your email marketing funnel can become highly complicated with time. For the broadcast emails, write a rough template for the email that you are going to send out every time you have new content on your site. You don’t want to set up a complicated set of sequences right from the start – you need to acquire knowledge about your subscribers first to be able to set this up effectively. 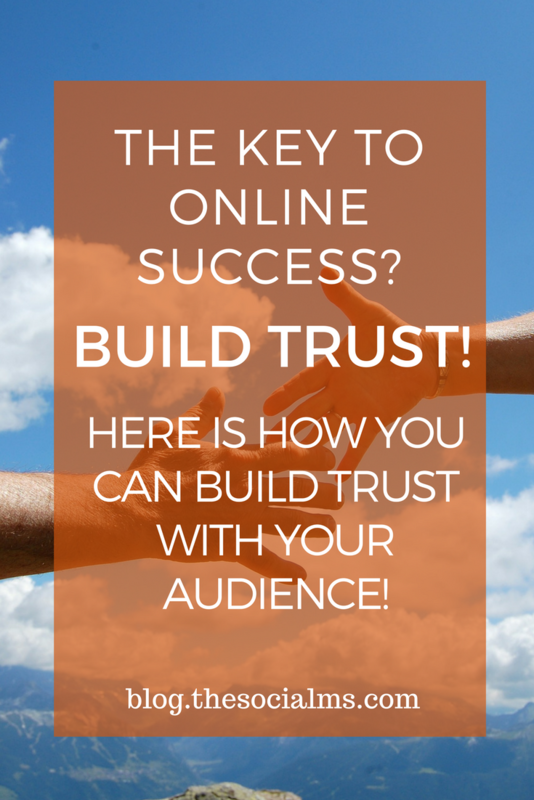 Everything that we’ve talked about until now has been about generating trust. But you also want to use this trust to sell your subscribers your high-value products or services. We mention our ebooks in some of our emails but only below the valuable email content that we provide. 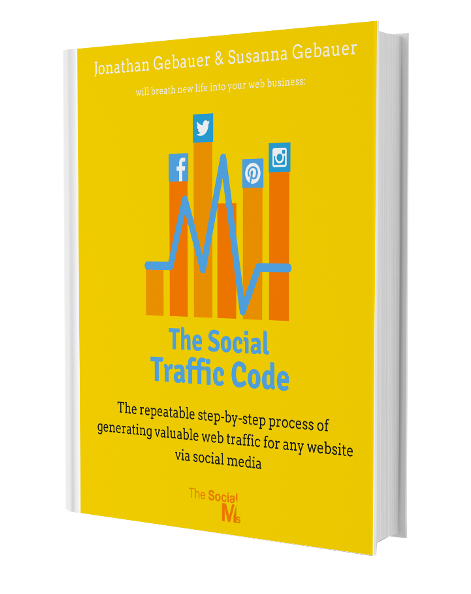 As noted above, you can send a maximum of 10% of pure sales messages to your list. We use these to promote special offers both on our ebooks as well as our higher value products. You need a tool for landing pages both for your sales pages and some signup pages. We recommend LeadPages which comes with both an easy to use drag&drop landing page builder and 100s of great landing page templates that are already highly optimized for almost any purpose. 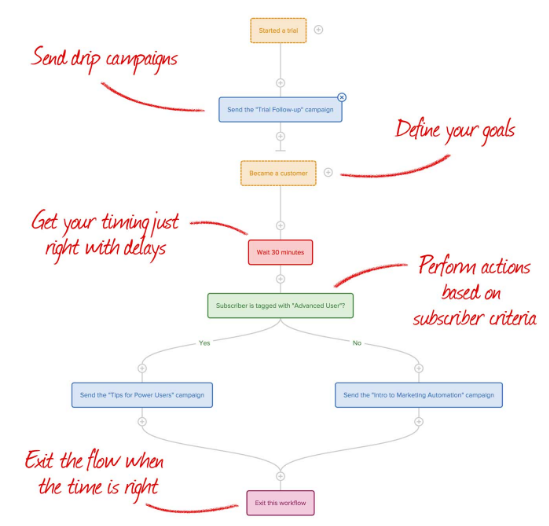 Drip’s Workflows are a gamechanger in email marketing! The email marketing tool that makes it by far easiest to build automation sequences over time is Drip. It is what we use, and you can also read our review here. Best of all, you can start out using it for free (for less than 100 subscribers). As an email marketing tool, Drip does provide all the features you need to perform this strategy. First, there is the above-mentioned LeadPages, which offers an additional feature called LeadBoxes: Lightboxes which popup above the content on your website and that we use to offer content in return for email addresses. You can freely design these LeadBoxes and set them to pop up at various points of your visitor’s interaction on your site (even when the visitor intends to leave). You can also implement the mentioned content upgrades with the help of LeadBoxes. An alternative to HelloBar with more options but also a higher price is Sumome. A key factor for any email marketing strategy is that you need to constantly grow your email list. 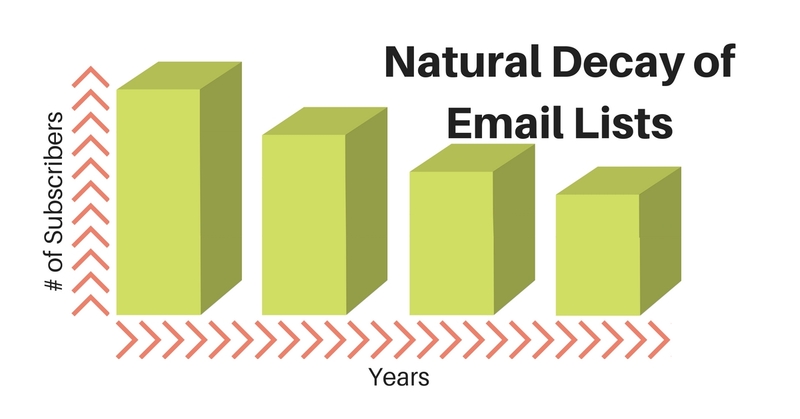 The reason for that is that you need to factor in the natural decay of email lists: Email addresses become unresponsive by roughly 20% per year (people change their jobs, become uninterested in the topic, unsubscribe, …). Therefore you will either need to keep growing your list, or it will become worthless over time. Don’t try to generate trust for worthless products – you are ultimately trying to get people to buy repeatedly from you, not just once. Don’t try to create a perfect funnel right from the start – as with everything marketing related, try to constantly optimize after starting with a small version of what you’ve read above. If you do this right, your email marketing strategy is perfectly suited to generate the trust you need within your audience!